On August 23, 2018, when jointly meeting the press with Minister of Foreign Affairs Damdin Tsogtbaatar of Mongolia in Ulaanbaatar, State Councilor and Foreign Minister Wang Yi said that the Belt and Road Initiative is an international public product that China provides for the world. It is neither a "Marshall Plan", nor a geostrategic concept. Ever since the very beginning of proposing the Belt and Road Initiative, the Chinese side has been adhering to the principle of extensive consultation, joint contribution and shared benefits, sticking to the concept of transparency, openness and inclusiveness, complying with international rules and laws of various countries, pursuing green, environmental protection and sustainability, striving to build projects featuring high quality and high standard, and also laying emphasis on financial sustainability. These important proposals and ideas are consistent with the opening-up strategy featuring mutual benefit and win-win results that China has upheld for a long time, and also serve as China's vivid practice of building a community with a shared future for mankind together with countries around the globe. Wang Yi pointed out that the Belt and Road Initiative aims to exploit new cooperation space and tap into new cooperation potential through integrating the development strategies of various countries, thus achieving common development and shared prosperity. In this process, the Chinese side is willing to share its development opportunities with various countries and welcome everyone to catch a ride on the express train of China's development. The Belt and Road Initiative is in conformity with the trend of the times and is full of vitality, thereby receiving immediate global support and response. 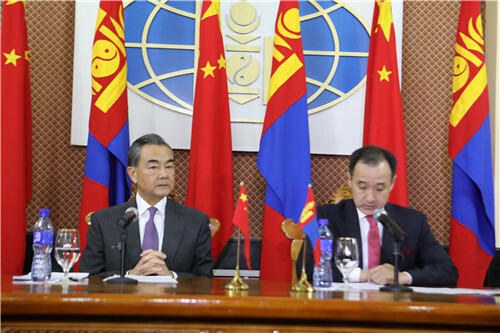 In response to questions about how China and Mongolia should promote the joint construction of the Belt and Road Initiative, Wang Yi said that China and Mongolia are connected by mountains and rivers, which makes Mongolia a natural partner for the joint construction of the Belt and Road Initiative. The participation of the Mongolian side in the Belt and Road Initiative will give new wings to and provide new impetus for its own development and revitalization. China and Mongolia have signed a cooperation agreement to integrate the Belt and Road Initiative and Prairie Road Development initiative. The Chinese side is willing to attach great importance to Mongolia's national development goals and the needs of the Mongolian people, and also speed up the integration process to jointly build the Belt and Road Initiative. Wang Yi said that first of all, we are willing to fully support Mongolia in accelerating its infrastructure construction, so as to help Mongolia to break the bottleneck of its development and create development conditions. Second, we will focus more on improving the people's livelihood in Mongolia, so that all Mongolian people can obtain tangible benefits from the participation in the building of the Belt and Road Initiative. Third, we will pay more attention to environmental and ecological conservation, and work hand in hand with the Mongolian side to build a green Silk Road, so as to conserve and develop the green mountains and clear waters in Mongolia. Fourth, we would like to help Mongolia turn its resource advantages into development advantages, and boost its processing and manufacturing industries, thus helping Mongolia to achieve diversified development and improve its capabilities of independent and sustainable development. In short, the cooperation between China and Mongolia can be compared to mutual assistance between friends and mutual support between neighbors. As President Xi Jinping said, China's cooperation with Mongolia is not about one wins and the other loses or one wins more and the other gets less, but commits to realizing mutual benefit.